Hi. 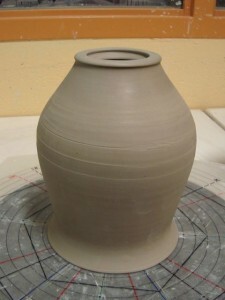 Here’s how I make a lidded jar. 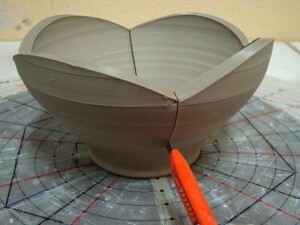 First, it is thrown on the wheel, dried, flipped, dried some more, trimmed. This is the result. To me it sort of looks like a tulip glass, but it wasn’t chosen for any reason other than I just happen to find that shape to be beautiful. 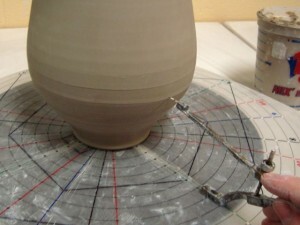 I begin to mark a repeating elevation on four evenly space places around the pot, usually at the widest part, using a compass with the pencil removed. This gives me reasonably consistent results. 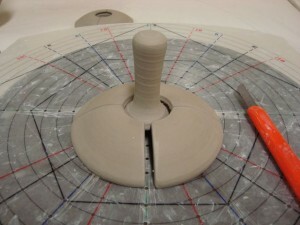 I open the compass wider and make another set of four evenly spaced marks exactly halfway between the first set, and an inch or two higher up on the pot. 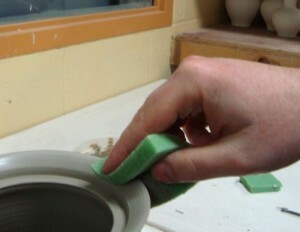 I sponge the lip and foot with a very wet sponge to help prevent the clay from chipping apart at those places like it wants to. 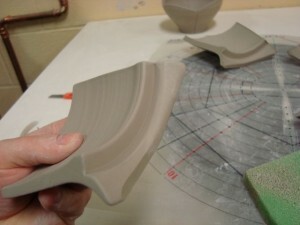 After letting the new moisture settle into the clay, I flip it over and get ready to cut it. I cut a series of “u” shapes using the small pin holes as a rough guide. I rarely manage to hit the marks exactly, but the help at least keep things sort of consistent. I remove the whole bottom section. 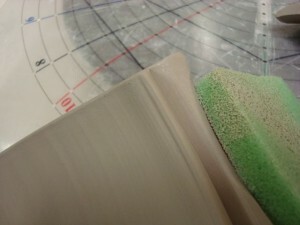 I remove the top section from the banding wheel and put the bottom half there, right side up. I cut the bottom section in half vertically at the bottom of the V on two opposite sides. 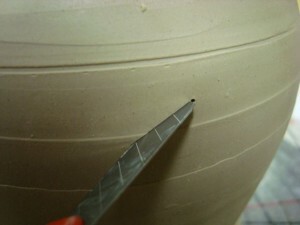 The edges are carefully rounded with a sponge. 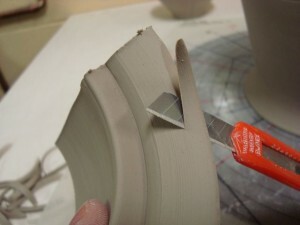 The joining faces are carefully scored with my trusty scraper. 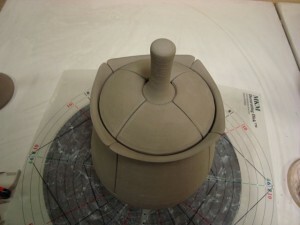 And then slip is applied. Then they are stuck back together. 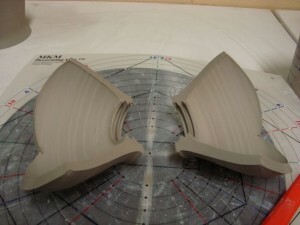 I set that part aside while the slip sets up. On to the top section. It is quartered. 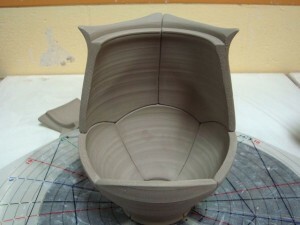 I used the bottom of each ‘U’ shape as the dividing point, resulting in a nice staggered joint pattern. It works structurally the same way a common bond brick pattern does. 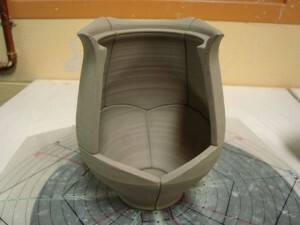 The staggered seams will help hold the piece together during glazing and firing. 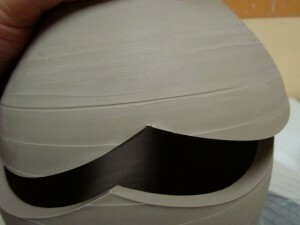 For the undulating, flower-like lip-line, I whittle away a bit from the middle of the lip and then sponge that smooth. I am careful to keep the order of the parts preserved to save myself from some puzzle solving later on. 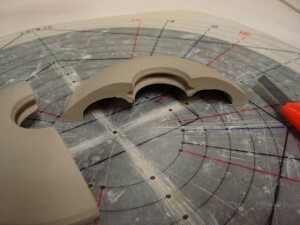 These parts are scored and set aside as I finish the bottom section. 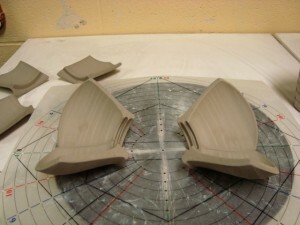 Now, the bottom section is split again on the other ‘V’ shapes. They are cleaned up and scored. 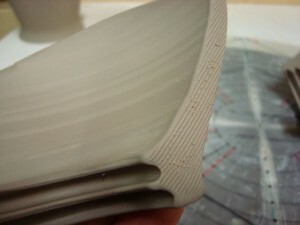 From my stash of finished floor discs, I take the one that fits perfectly, and insert it into the groove. I put the two halves together and make sure everything fit nicely. 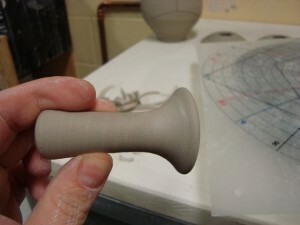 If it is a bit tight, I adjust the diameter with a sponge until it is perfect. 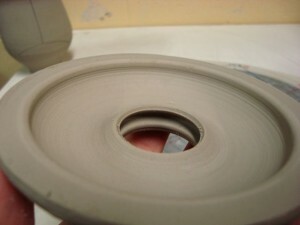 I slip and reassemble those parts, careful not to let any slip touch the disc. 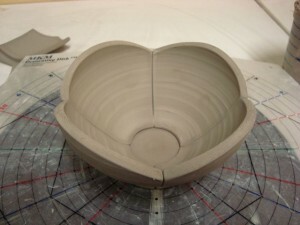 It must be free-floating in the groove to allow for expansion and contraction. If you know anything about cabinet making, this will make perfect sense. 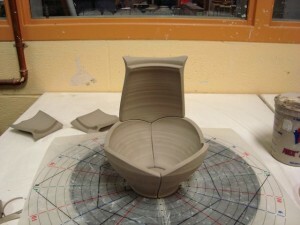 Next, I begin to Reassemble the top half, in place, one piece at a time, like this. Now the body is finished. 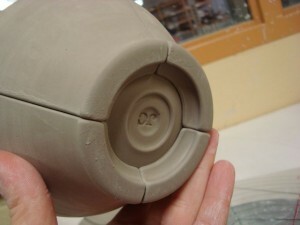 The lid is put together in a very similar fashion. 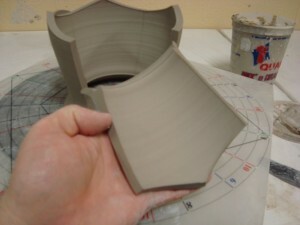 This pattern is called “Arches” when applied to vertical forms, and “Tortoise” when applied to bowls. They can be found on serving bowls, cereal bowls, and mugs in my Etsy Store. I know you want one! 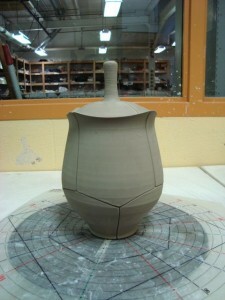 Love your work, really nice to have insight into the process. Thanks for sharing. Amazing. 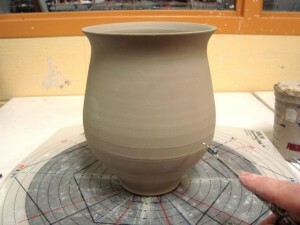 I used to make functional porcelain pottery about 15 years ago but then the internet happened and I switched careers… so I have some experience with it. 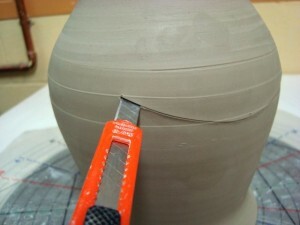 How in the world do toy avoid cracking… that must be some slip and clay body! 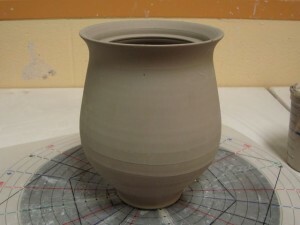 Love the modular construction and now I can see exactly why you price your pots relatively high. 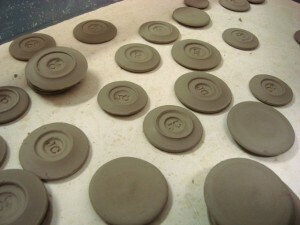 These are really like little sculptures made with great care. 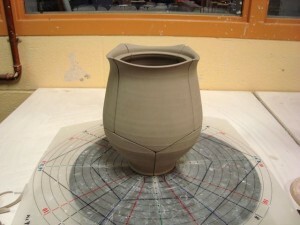 Very nice… and inspiring me to get back into clay… Thanks! Awesome tutorial! Thanks so much for sharing your process. 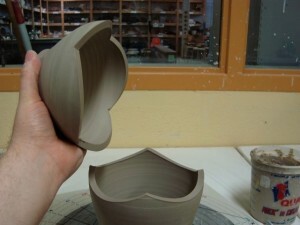 Your work is beautiful- a lovely balance between strong lines and fluid forms. I am in awe of your technique. 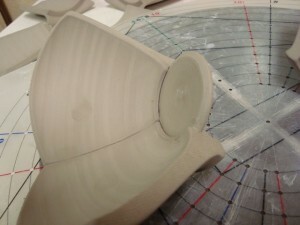 I am learning to make better fitting lids myself, but you take to the next level. Lovely! Thanks for the question, Chris. The slip is very tacky. 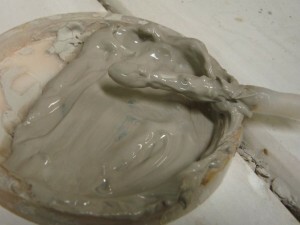 Think of wood glue. It is sort of like that, due to the Darvan added to it. 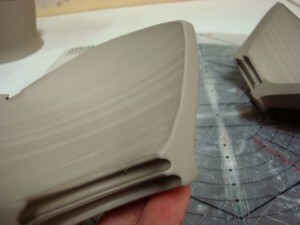 Also, as the two pieces are squished together, the slip forms a suction-like effect. 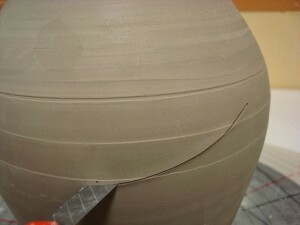 The walls of the pot will absorb the moisture witin 2-3 minutes, resulting a a more firm bond. This is the reason that I set aside the bottom and then prep the top. 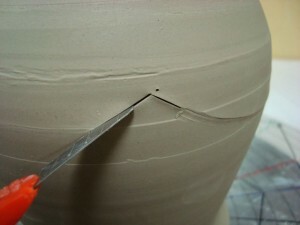 I am allowing that seam to set up. thanks for another great glipse at your amazing work! Yes, Julia, that is cheating. In fact, you shouldn’t even be looking at this! you are a brilliant lunatic! Absolutely incredible Jeff…Makes me feel like a bull in rthe proverbial china shop! excellent, excellent… what a great step by step tutorial. the care and precision are seductive to say the least. Wow, thats pretty impressive! 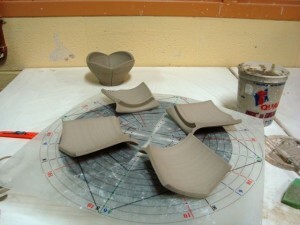 Love what your doing and this article gives us new appreciation for your work. 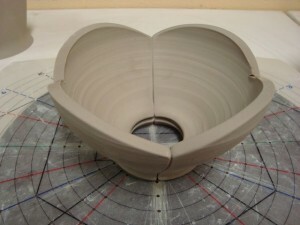 You have knocked my socks off with your pots. 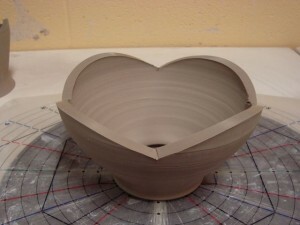 I just discovered them tonight on Etsy and followed the link to your blog where I hoped to see how your work was made. Thanks for such an informative posting. 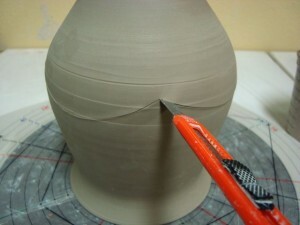 I’m inspired to try some cut-n-paste on my pots. Awww-Full nice to see how you do what you do! Even though I see how, you are still a Magician I think. Thanks for taking the time to post your fun, Jeff. These are simply amazing. 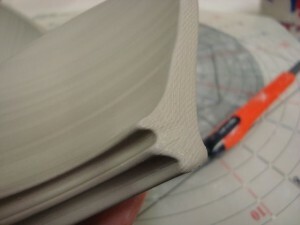 I am wondering how exactly you go about making that groove to place the disk in the bottom… Do you simply trim that with a tool while it’s still in one piece? Thanks Matt! I’ve been trying to figure out something quick to do another blog post about. It’s been way too long since my last post, and I trim pots every day. I bent a kemper trimming tool and use it to trim when I trim the foot. I’ll make a nice post about that. I see why you can publish your methods freely; who else would be brave enough to try doing this? We all know the Devil is in the details. Amazing work and an excellent description. 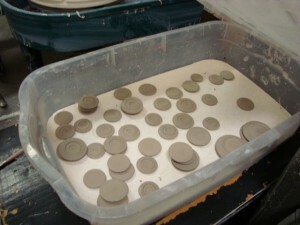 How many pots did you go through to get to the level of skill you now command? I first saw your work in PMI then in person at AKAR, beautiful, and intriguing.